Western blot analysis of extracts from HCT116 and NIH/3T3 cells using Tri-Methyl-Histone H3 (Lys27) (C36B11) Rabbit mAb (HRP Conjugate). Supplied in 136 mM NaCl, 2.6 mM KCl, 12 mM sodium phosphate (pH 7.4) dibasic, 2 mg/ml BSA, and 50% glycerol. Store at –20°C. 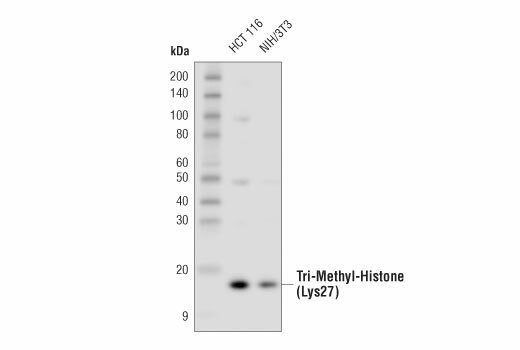 Do not aliquot the antibody..
Tri-Methyl-Histone H3 (Lys27) (C36B11) Rabbit mAb (HRP Conjugate) detects endogenous levels of histone H3 only when tri-methylated on Lys27. The antibody does not cross-react with non-methylated, mono-methylated or di-methylated Lys27. In addition, the antibody does not cross-react with mono-methylated, di-methylated or tri-methylated histone H3 at Lys4, Lys9, Lys36 or Histone H4 at Lys20. This Cell Signaling Technology antibody is conjugated to the carbohydrate groups of horseradish peroxidase (HRP) via its amine groups. The HRP conjugated antibody is expected to exhibit the same species cross-reactivity as the unconjugated Tri-Methyl-Histone H3 (Lys27) (C36B11) Rabbit mAb #9733.